Are you trying to decide if a Disney Cruise is worth the cost? There is quite a price difference between the price of a Disney cruise and other cruise lines like Royal Caribbean & Carnival. What you need to know is that if you are looking for an inclusive family vacation, Disney Cruise Line is the one to take. Other cruise lines offer you a low initial fare, but then nickel and dime you once you get on board. 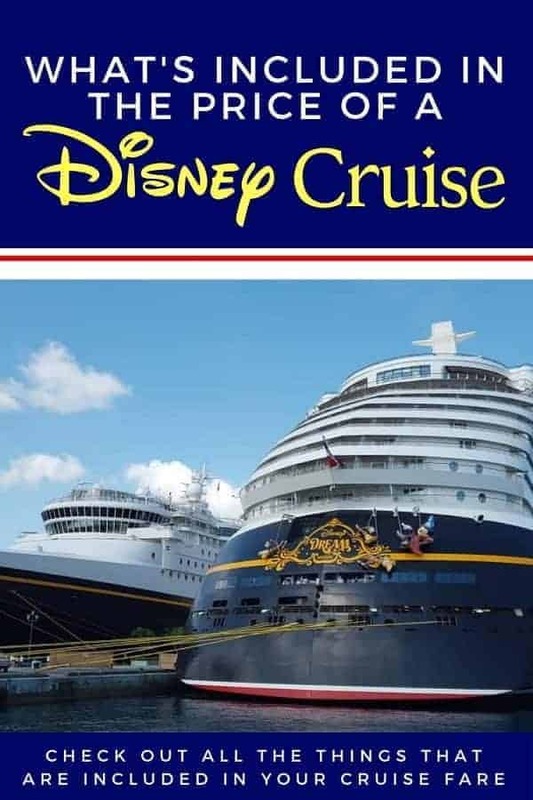 We have traveled on Royal Caribbean, Carnival & Disney Cruise Line and one of the reasons why Disney Cruise Line is my favorite is because of what’s included in the price of a Disney Cruise. How Much is a Disney Cruise? The first thing that people look at when they are planning a Disney Cruise is the price. Often, they are overwhelmed with the price of a Disney Cruise because it is so substantially more than many of the other cruise lines. The lowest I’ve seen a Disney Cruise price be for a family of 4 (2 adults/ 2 children under 9) is for a three night cruise to the Bahamas. You will be able to go for a little over 2K if you cruise in the off-season (Jan/Feb) and don’t mind an interior room on one of the older ships (Wonder/ Magic). That same cruise in the summer (June/July/August) will cost you 1k more! If you would like to take a 5-7 night cruise during the summer months anywhere off the coast of the USA, you will pay upwards of 6-7k for that same family of four. So, what do you get for that kind of money? Disney includes quite a bit; things that other cruise lines will charge extra fees for. As you can see, you are getting quite a lot for the price of a Disney Cruise. It is up to you to decide if that heavy price tag is worth it. What I will tell you is that every Disney Cruise I’ve taken has been worth every penny spent. It is like going to Disney at sea but you actually get time to relax! If you are still considering a Disney Cruise, but hoping to get a lower fare, then be sure you read how to score Disney Cruise Line deals. We tend to see the best bargains during the winter months or on last minute sailings when the ships aren’t full. What do you think about what’s included in a Disney Cruise? Is it worth the price? You say soda, juice and coffee are unlimited but didn’t mention water. Going for our first time in August and was wondering if water included. Bottled water is not included, but tap water is in the drink dispenser and has never been an issue because they have a strong water filtration system on board the ship. . Bottled water is available for purchase.